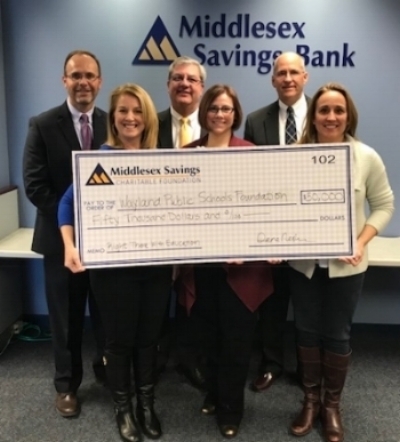 THANK YOU, Middlesex Savings Bank! This $50K gift will be used to fund grants to benefit all five Wayland Public Schools. Mike Kuza, Assistant Vice President, Community Relations and Foundation Officer, Middlesex Savings Bank, Bryan Christensen, Senior Vice President and Director of Community Banking, Middlesex Savings Bank, Mike McAuliffe, President and CEO of Middlesex Savings Bank, Angela Malkin, WPSF Vice President, Nicole Spiewak, WPSF Marketing, Liza Knapp, WPSF President at the "Big Check" ceremony on February 9, 2018. SPRING PARTY 2018: OUR annual Spring fundraiser: Kentucky derby Style WAS a HUGE SUCCESS! The success of this year's party would not have been possible without the support of the many businesses and individuals that contributed their time and auction items. Thank you to the Wayland community for supporting our annual Spring Fundraiser and the WPSF's mission. Congratulations to THE 2018 WPSF Spelling Bee Participants! The Wayland Public Schools Foundation hosted the 27th Annual Spelling Bee on Sunday, March 18th, 2018. The annual Spelling Bee is a fundraising event for the Foundation, welcoming over 350 elementary Bee participants, 70 community volunteers, and over 1000 guests.